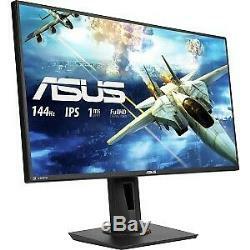 Asus VG279Q 27 FullHD 1920 x 1080 144Hz FreeSync IPS 1ms LCD Gaming Monitor. ASUS VG279Q 27 Full HD 1080p IPS 144Hz 1ms (MPRT) DP HDMI DVI Eye Care Gaming Monitor with FreeSync/Adaptive Sync. 27 Full HD (1920 x 1080) IPS 1ms MPRT gaming monitor with ASUS GameFast Input Technology for a fully responsive gaming experience. Marathon ready with ASUS Eye Care Technology to minimize eye fatigue and an ergonomic stand with full height/tilt/swivel/pivot adjustments to accommodate any desk. Exclusive GameVisual & GamePlus functions to enhance color performance and control. FreeSync/Adaptive Sync with 144Hz refresh rate for a tear-free experience with AMD Radeon GPUs. Shadow Boost enhances image details in dark areas, brightening scenes without over-exposing bright areas. Designed for intense, fast-paced games, ASUS VG279Q is a 27 Full HD gaming IPS display with an ultra-fast 1ms (MPRT) response time and blazing 144Hz refresh rate to give you super-smooth gameplay. VG279Q features Adaptive-Sync (FreeSyncT) technology to eliminate screen tearing and choppy frame rate. Gamer-centric features like ASUS GamePlus enhances your in-game experience, while GameVisual provides various pre-set display modes to optimize visuals for different types of games. With an astonishing 144Hz refresh rate, fast-moving visuals pose no problem for VG279Q. There's no frustrating lag, so you get the upper hand in first person shooters, racers, real-time strategy and sports titles. Lightning-fast 1ms (MPRT) response time with ASUS Extreme Low Motion Blur. ASUS VG279Q is the fastest in its class, boasting a 1ms response time (MPRT) to eliminate smearing and motion blur. There's also the ASUS Extreme Low Motion Blur (ELMB) Technology to make objects in motion look even sharper, so gameplay is more fluid and responsive. ADAPTIVE-SYNC (FREESYNCT) TECHNOLOGY FOR SMOOTH GAMEPLAY. Adaptive-Sync (FreeSyncT) technology delivers the smoothest, fastest, and most breathtaking gaming visuals imaginable by eliminating screen tearing and choppy frame rates, and by minimizing display stutter and input lag. IPS technology for consistent, accurate color. ASUS VG279Q gives you superior images with outstanding colors thanks to an astounding 1,000:1 contrast ratio. Wide 178-degree viewing angles ensure minimal distortion and color shift even when you're viewing from extreme positions. ASUS Shadow Boost technology clarifies dark areas of the game world without overexposing brighter areas - improving overall viewing while also making it easier to spot enemies hidden in dark areas of the map. GameFast Input Technology - because milliseconds count. Input lag on an LCD monitor is typically much lower than a TV, and ASUS VG279Q features GameFast Input Technology to further minimize input lag. Your command delay appears on the screen and you are been attacked VG279Q Your command appears on the screen instantly and you can evade the attack. Rich connectivity options, a narrow bezel design. ASUS VG279Q has extensive connectivity options, including dual-link DVI-D, DisplayPort 1.2, and HDMI(v1.4) port, so you can hook it up to a wide array of multimedia devices. It has a super-narrow 1cm bezel ideal for an immersive and panoramic gaming setup. The item "Asus VG279Q 27 FullHD 1920 x 1080 144Hz FreeSync IPS 1ms LCD Gaming Monitor" is in sale since Thursday, December 27, 2018. This item is in the category "Computers/Tablets & Networking\Monitors, Projectors & Accs\Monitors".